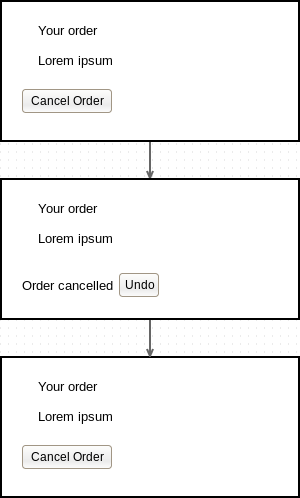 (opposite of cancel) order. (this choice means don't do anything with order) by default, this choice on other cases should be "Cancel". What is the opposite of cancel on this case? Keep in your mind, cancel is usually what you press to decline an action in a UI situation, and here on my second choice, I am trying to do that. Cancel might be too vague. I always like to be more descriptive when asking users to perform a quite destructive task. This often reduces any anxiety users might have. One goes back, the other one forward. Maybe too forward-ey though? "Cancel" in computers has very well defined meaning of "don't do the thing". That's the root of the problem here, as here the thing we're doing is "cancelation(sic) of an order". I believe the best way would be to avoid using the word "cancel" to describe an action, rephrase it to something like "revoke order" or "dismiss order". It's not natural, but at least not as confusing as "yes, cancel" - "no, proceed". I know another answer with Yes / No buttons has already been given, and accepted, but I just want to add this. If a button says something and then a confirmation dialog pops up saying "are you sure you want to ..." and the same word, there is often a knee-jerk reaction to hit "Yes" without giving it much thought. So the user hits a button called "Cancel" and the dialog says "Are you sure you want to cancel?" then the natural reaction is going for Yes. That's the button I clicked, so that's what I want to do! A better approach would be to briefly describe what would happen without using the word "cancel" again. Or the words "are you sure". This will remove your standing order. Proceed? Do you really want to cancel this order? No, please take me back to the ordering screen so I can continue with this order. Yes, I want to cancel this order. I always provide the "Oops" choice first, when it's a negative action. It slows people down and makes them reread the prompt. My opinion is that the "cancel" button should be visible for the user, but in the case, it is the only button on the page, the user could be influenced and will be not in your interest that he change his decision to make that order. I suggest you add a disabled button with "Confirmed" because he confirmed the order when he finished it or a button with "Edit" if he has this option. "I change my mind" "-go back to order"
You might also consider to use graphics to enhance the text. For example, a "happy smile face" might provide a hint which button to press to not break things. Of course, some users will consider anything graphical as frivolous and maybe will even flag any graphics they encounter as a critical bug. Seriously. I would use a different terminology rather than Cancel with a greater meaning and understanding what would happen. "Yes, proceed to cancel" should be in a text-link format (underlined and blue color to be optimal). This lets users to make a deliberate choice to click it. "No" should be in a button form and should be in a 'selected' state by default. Ok confirms the operation and cancels the order. Cancel cancels the operation, ie. the order is not cancelled. "Cancel" always aborts a confirmation dialog / operation. User hits Cancel Order on the parent page and Ok on the confirmation dialog - seems pretty intuitive and they don't need to read anything. Can you please tell us if you want to cancel your order? Yes, that's precisely what I am willing at doing. No, I don't really intend to do such a thing. Not the answer you're looking for? Browse other questions tagged user-behavior buttons mobile-web popup confirmation or ask your own question. The best way to arrange buttons for a complex calculator UI?